Well this was a surprise find on my doorstep! 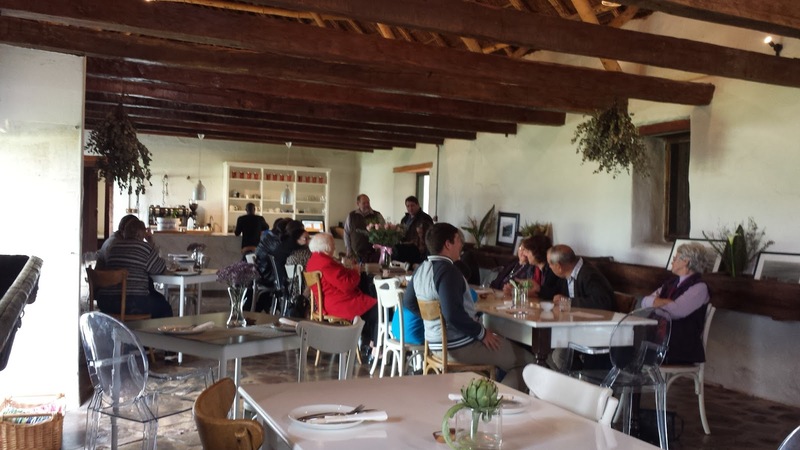 A friend of mine told me about a lovely breakfast she had at this winery (Phizantekraal) not far from where we live. 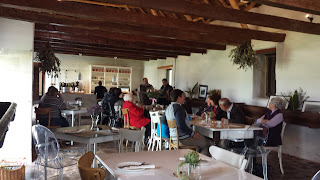 Then one day, my boyfriend surprised me with a trip to Phizantekraal for breakfast. This is not even 5 minutes drive from where we live and we have now dined here twice since finding out about it. 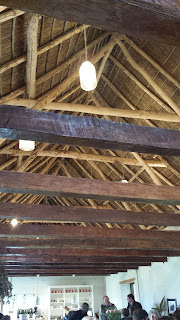 The main building where the restaurant is, was built in the 1700's. They have built an extension for the tasting room. The place looks modern, smart and yet quaint and charming. I love the place. My battery on my camera died when I wanted to take a photo of the building, so I have taken this photo from the Phizantekraal website. 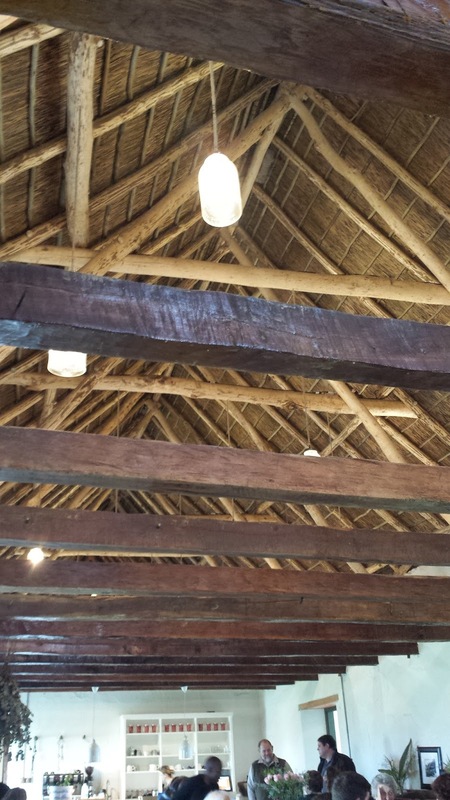 You can see the front part (the brick part) is the new extension to the original building with the thatch roof in the back. We had a very nice breakfast. The menu is small but there is something for everyone whether you want the good old bacon and eggs, something sweet like french toast or something warm and wintery like porridge. Our meals were nice and the service was fine, though they did take a while to bring the bill; I had to ask a few times for it. There was a big group celebrating a Grandma's birthday on the day we dined here. I have to say this restaurant is ideal for couples, families, baby showers, birthday celebrations and more. It really does cater for everyone and the setting is so humble, low key and relaxed. After breakfast we went through to the tasting room to try the wines. 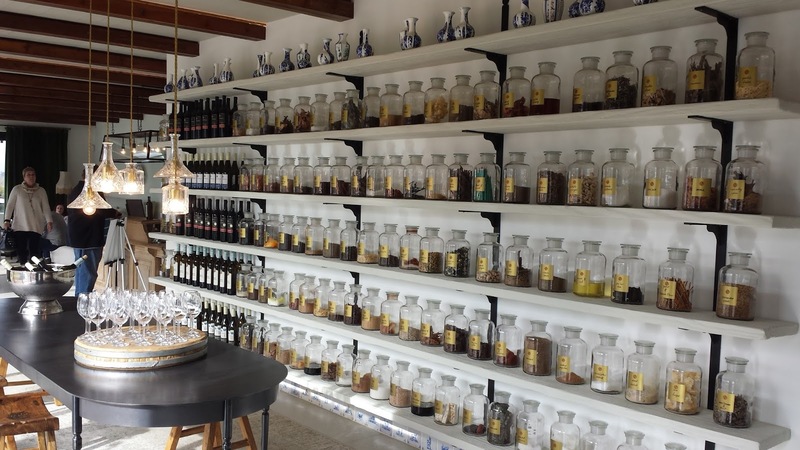 They have a wall of jars filled with different aromas for characters of wine. They have a big range of aromas like tobacco, aniceed, wet rocks, almonds plus many more. 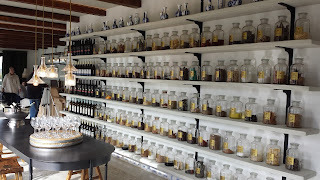 We spent a good amount of time smelling all the jars, it was a lot of fun. This picture is from the Phizantekraal website. As you can see, the tasting room is very modern and has lovely big windows for you to enjoy the view. Like the day we visited the weather it was a bit dismal and it looks like it was the day this photo was taken too. I can imagine on a clear day the views must be very nice. Even when the weather wasn't great, the views were also lovely. Now, getting to the wines, I was impressed. Apparently they have been selling off their grapes for a long time and still sell off a good portion, however they now make wine from their vines also. Quantities of wine production are low and the quality of the wine is very good, especially for the price. Sauvignon Blanc 2014 (R58 a bottle): Medium to pronounced nose, more fruity in style. Light in body, medium - high acidity, green fruit - like granny smith applies - on the palate. Soft, creamy, and a little floral. Chenin Blanc unwooded 2014 (R48 a bottle) had medium intensity on the nose, smelled like smelly cheese (strange I know). It was fruity on the palate with hints of peach, apricot, pineapple and pear. There was also a little bit of floral and some green characters to the wine like bell pepper and asparagus. It had medium acidity, medium body, and a good mouth feel. It was a pleasant wine. I had a glass of this wine when we dined here a week later. It went very nice with the curry dishes we had. Chenin Blanc wooded (R85 a bottle) had a medium lemon colour, medium intensity on the nose. It had nice aromatics. On the palate I picked up fruity flavours including some hints of melon. This wine was soft, round mouthed, creamy, had medium body, medium - high acidity. It had lovely oak character with hints of nutmeg and cinnamon. The oak is subtle. 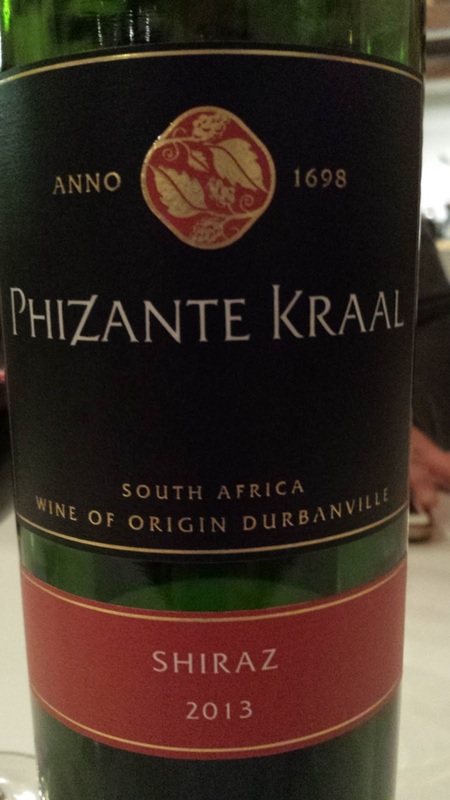 This wine had flavours of apple, raisin, saltanas, nutmeg and custard. Reminded me of a bread and butter pudding. This wine also had some floral character to it. This wine was nice. Cabernet Sauvignon 2013 was a medium ruby colour, had medium intensity on the nose and medium body. There were some soft wooden spices coming through on the nose and I picked up plums and some sweet characters on the nose also.It was soft, had lovely red fruit with some raspberry flavours and some spice on the palate. There was aniceed/liquorice, followed by a plastic feeling on the finish. Soft tannins, ready to drink now. This wine impressed me more than the reds and was nice. We had a bottle of this with our dinner on the next occassion we visited this winery. It is very good value for money and very pleasant with food. Shiraz 2013 had a dark ruby colour. It had intense aromas with dark fruit character. This wine was soft, had hints of christmas fruit cake and a little bit of citrus (orange specifically). It had medium body, soft tannins, was rich and had good length. Again I was impressed with this wine. We had a bottle of this at the three course dinner also, again it went down well with our food. Our friends were really impressed by the wine and the price! I am more of a white wine drinker, but the reds stood out for me more than the white wines. Which did surprise me considering Durbanville has become well known for their white wines. All of the wines are nice and very good value for money. The tasting room manager did a good job of presenting the tasting. It was clear that she had been with the company for a while and knew the wines well. It was an informative tasting and she was very pleasant. The tasting costs R20. Once a month they open their doors for dinner. It is a set three course dinner and themed. We attended the one in June which was a Middle Eastern Winter Flair for only R180 pp. The food was very nice, presentation was good and the timing of the dishes coming out was done nicely. 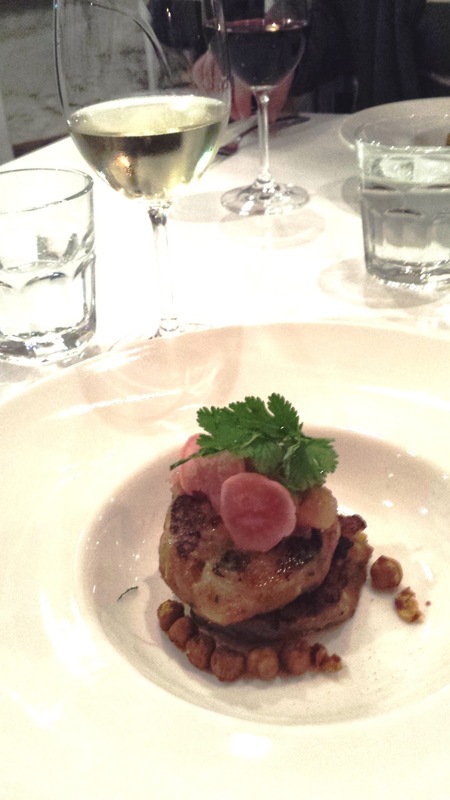 This is a photo of the starter we had. Aloo Tikka with Chutney & Pickled Radish. The food as you can see was nicely presented and creative also. This was a delicious meal! For our main the following dishes were placed in the middle of the table and everyone could help themselves, there was plenty to go around, the portions were generous. Lamb & Sweet Potato Curry with Cashew Butter Paneer, Turkish Apricots, Rice & Lentil Pilaf, Buttered Naan. For dessert we had Honey Orange Cake with Pistachio Cream. They served this with Masala Chai Tea which was delicious! A bonus to dining here is that you get the wine at cellar door price!! The three course dinner was really good value for money and a lovely evening to catch up with friends. It is great to have another dining option in the Northern Suburbs. If you are out this way, be sure to stop by. It really is a lovely place for a wine tasting, breakfast, lunch and dinner (the latter is by appointment only and you need to find out what date they are holding them)!